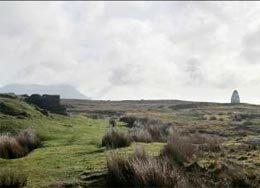 A series of weekly community-hosted workshops in history, archaeology, geography, geology and computer skills were provided to communities associated with the ancient Tóchar Padráig pilgrimage route in County Mayo. 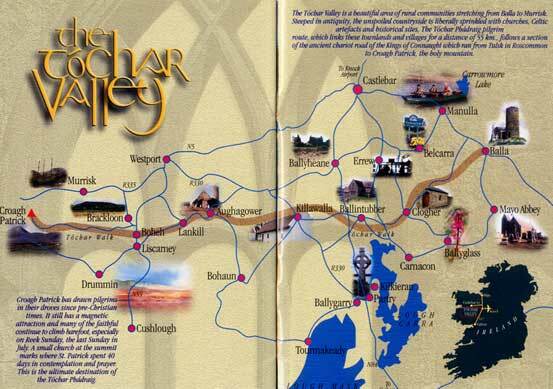 This assisted with the initial formation and development of the Tóchar Valley Rural Community Network and the production of a guidebook. This research project was initiated and is directed by Dr Conor Brady, Dundalk Institute of Technology (DKIT). 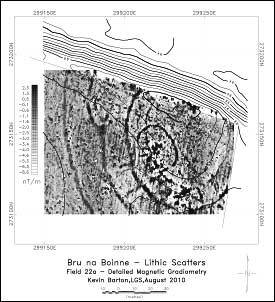 The geophysical field survey by LGS is funded by the Heritage Council and DKIT excavation by the Royal Irish Academy. 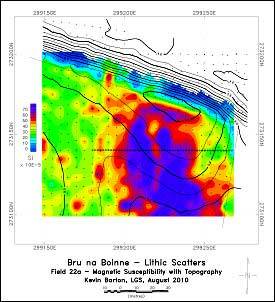 The project is designed to explore the geophysical properties of a selection of lithic scatter sites in the Boyne Valley adjacent to the Brú na Bóinne World Heritage Site(WHS)in County Meath. This research takes a fresh approach to the landscape of Brú na Bóinne as it takes the landscape of the monuments as the starting point rather than the individual monuments themselves. Generations of researchers have focused attention on the monuments, and have added significantly to our understanding of the development of the complex. However, a question that has not been adequately addressed is that of the patterns of settlement across the wider landscape. This is one of the 'Big Gaps' in knowledge identified and proposed for attention in the Brú na Bóinne World Heritage Site Research Framework. Preliminary investigation of this question involved a systematic fieldwalking survey of ploughed fields within a defined study area designed to identify and record the locations and characteristics of lithic scatter sites. 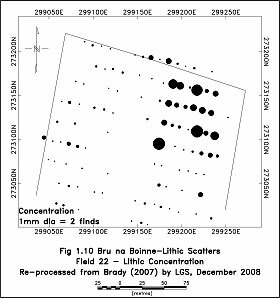 A small selection of lithic scatter sites was then investigated using topsoil magnetic susceptibility and topographic survey and produced very promising results that were complementary to the lithics data and were suggestive of settlement-related activities. Rossnaree: Lithic scatter concentration and magnetic susceptibility enhancement in the northeast corner of the field. The current research focuses on a selection of lithic scatter sites identified and uses a flexible multi-technique approach including topography, magnetic susceptibility, magnetic gradiometry and earth resistance, in order to further explore the activities associated with their initial formation. 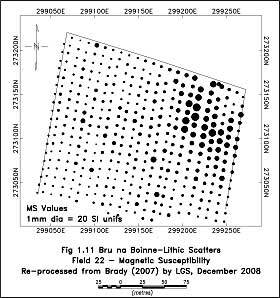 Depending on the nature of the responses encountered in the magnetic data at particular sites, further targeted magnetic gradiometry with a higher sampling interval and earth resistance has been used. Where appropriate, these techniques have been supplemented by targeted use of electrical resistivity tomography (ERT) and ground penetrating radar (GPR). 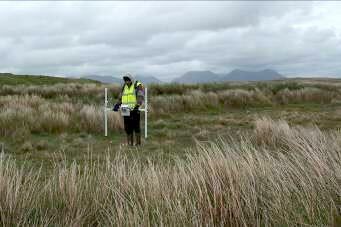 Rossnaree: Detailed magnetic gradiometry and topsoil magnetic susceptibility survey carried out to target an excavation. The gradiometry image shows four enclosing ditches with an inner oval-shaped enclosure cutting the fourth or inner ditch. The susceptibility image shows enhancement in the inner area which may be due to settlement and/or industrial activity. Brady, C. 2007. The lithic landscape of the Newgrange environs: an introduction. In M. Larsson & M. Parker Pearson (eds), From Stonehenge to the Baltic: living with cultural diversity in the third millennium BC, BAR International Series 1692, 213-20. Oxford: Archaeopress. Other references can be found in our publications and presentations page. "Yes, there is not much to see but the emotion is intact. We discover, after crossing the mountains of peat, which is not the slightest interest in the visit - the site of the destroyed center of Marconi wireless transmissions (little explanation, except that the local allowed up to 300 employees and they were destroyed in 1922 by the Irish Civil War) which started the first radio in 1907, between Europe and America. We see a kind of warhead it is thrust into the ground five minutes to reach before discovering, painted over a sign saying "Alcock & Brown 500m landing site" ... With an arrow toward the marsh sending vaguely impractical (and perhaps dangerous) information of where their bomber nose dived in 1919 ... It must be said that the weather on the day of our visit, were appalling ... If anyone knows why the two Britons have been forgotten, so that Lindbergh went to posterity, as I drop a word here . 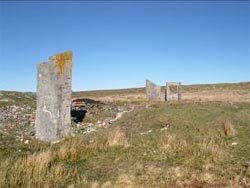 . ."
As can be seen from the quotation above the Marconi and Alcock & Brown sites hold great interest for tourists and also are a source of great disappointment due to a lack of interpretation and presentation. 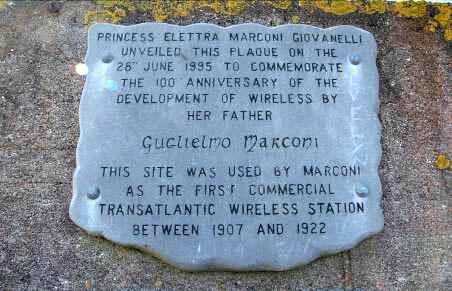 From 1907 until 1922 Ireland was a major player in the development of transatlantic wireless communications. In the current economic climate it is of great benefit to the tourist industry to maximise heritage assets of international significance. One such asset, in the West of Ireland, is undoubtedly the Clifden Marconi Station coupled with the Alcock & Brown connection, which makes this site unique. Given the undoubted historic and economic importance of the site, it seems incredible that the site has not received an appropriate analysis up until now. This deficit is now being addressed with traditional archaeological and historical research coupled with a topographic and geophysical survey of the site. The project is being carried out by the Clifden and Connemara Heritage Society with significant Leader funding from Letterfrack-based Forum Connemara. The research has the support of the National Parks and Wildlife Service. Shane Joyce, Project manager, local engineer & industrial archaeology researcher. Kevin Barton, Landscape & Geophysical Services. Michael Gibbons, local archaeologist, who has discovered many sites in the immediate vicinity of the Marconi Station and beyond. The project also draws on the expertise of local scholars and historians, Breandan O'Scanaill, Robert Jocelyn, and Kathleen Villiers-Tuthill. The team are working with the Bodleian Library in Oxford, where the Marconi Archive is now housed. A specialist researcher, Cathy Soughton, has been engaged and her endeavours have produced a wealth of new insights into the historical and technical aspects of the Marconi story. An important outcome of the Bodleian Library research has been the hitherto unknown findings regarding the extraordinary array of characters and personalities who spent time at the Clifden Station. These include famous engineers C.S. Franklin, H.J. Round, and George Kemp. The hitherto most well known person associated with the Clifden station was Jack Phillips, Chief Radio officer of the Titanic, who was lost in the disaster in 1912. The discovery of archives from the Royal Navy has provided a rich seam of key new data regarding technological developments specific to the Clifden Station. The geophysical survey is targeted on 9 zones or activity areas within the approximately 120 ha Marconi site in Derrigimlagh Bog. The survey will assist in understanding the layout and function of key elements of the site through the provision of new maps, plans and sections. The survey results will be integrated with the archaeological, historical and documentary research to interpret and present the site to the public. Marconi Wireless Station, Clifden, Co Galway: Magnetic gradiometry image of the southern part of the Condenser House showing the now overgrown bases of the iron stanchions which supported the roof. The project has been initiated and is directed by Dr Conor Brady, Dundalk Institute of Technology and Matthew Seaver, University College Dublin. Seed funding has been provided by Meath County Council. Further details on the project can be found at hillofslane.wordpress.com. 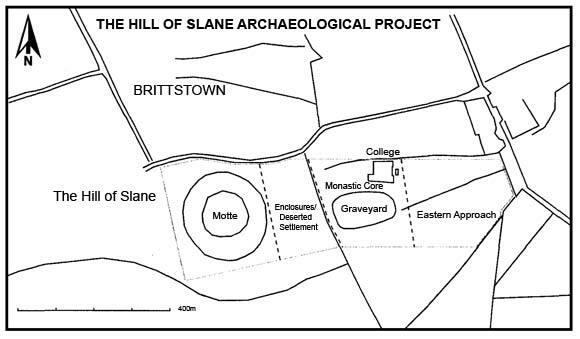 Hill of Slane, Co Meath: Outline Map showing the main visible monuments. 3. the evidence for High Medieval occupation of the Hill before the focus of settlement shifted to the area of the modern village. Initial work has focussed on the Early Medieval Period when the Hill functioned as a religious and political centre. It is likely that a substantial castle was built on a motte in this period. Initial investigations have been carried out on the motte which is a significant earthen mound. Historical sources suggest that the motte was constructed on a pre-existing, possibly prehistoric mound. The motte is some 45m in diameter and has a flat summit approximately 22m in diameter. There is a basal enclosing ditch whose depth is some 1.5 to 2m with a width of approximately 5m. The monument has steep sides and attains a height of up to 8m above the base of the ditch. The motte and surrounding area is heavily overgrown with scrub and mature trees and a recent LiDAR survey has been initially used to assess the spaceform of the motte and its associated elements. 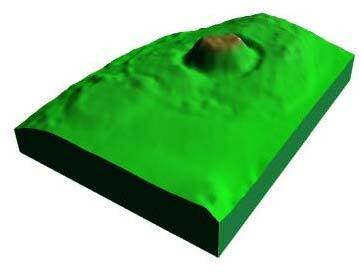 The LiDAR data have provided new evidence on the topographic and archaeological setting of the motte. Hill of Slane: A general topographic model of the motte, enclosing element and possible barrow based on LiDAR data by kind permission of Ordnance Survey Ireland. View from the northeast. The project will provide baseline archaeological data on a well-known but little studied archaeological site. The project addresses a number of research questions posed by the Brú na Bóinne World Heritage Site Research Framework. It is intended that the results will be used by a local community group, Slane Tourism, to provide additional information to develop the tourism potential of the site. It is also hoped that the results will inform any future decisions on the presentation of the site to the public. 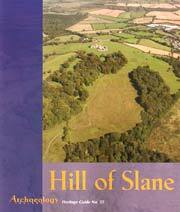 The first project publication, supported by Meath County Council, the Office of Public Works and the EU ArcLand Project, is the Hill of Slane Archaeological Guide published as a supplement to the Winter 2011 issue of Archaeology Ireland. Rathcroghan Mound, some 85m in diameter and up to 7m in height, is the Pre-Historic focus of the Multi-Period Rathcroghan Complex in County Roscommon. 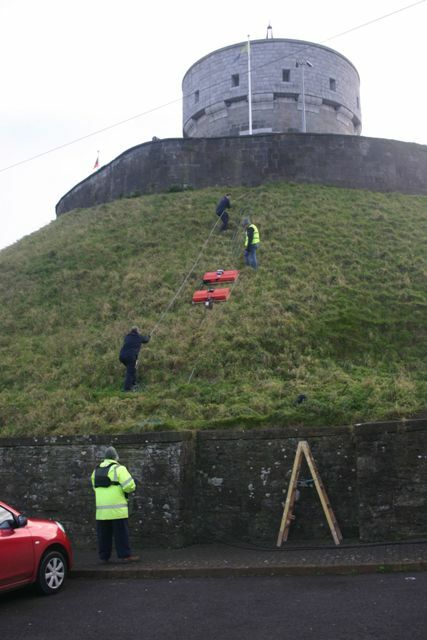 The Mound and other selected monuments were geophysically surveyed by University College Galway in the early 1990's as part of one of Ireland's earliest large-scale multi-method geophysical survey projects. The Heritage Council funded the project which was directed by Prof John Waddell and Kevin Barton. 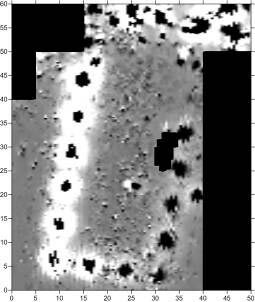 Geophysical work was carried out at a number of scales and discovered near-surface and internal archaeological features on, in and surrounding the mound (see Waddell et al., 2009). The site continues to be used to test new equipment and data processing techniques. Digital data collected in the 1990s have been re-processed and reassessed using software and presentation techniques more recently developed. 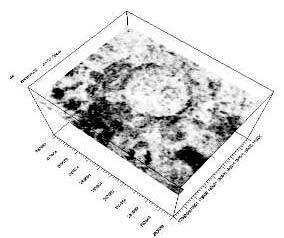 Newly available LiDAR data has provided further detail on the spaceform of the mound. In addition new terrestrial geophysical survey technology has been used to resurvey key elements of the mound at a higher spatial resolution to reveal finer archaeological detail. Rathcroghan Mound: A selected ground penetrating radar horizontal slice showing a circular enclosure buried in the mound. Waddell, J., Fenwick, J. & Barton, K. 2009. Rathcroghan, Co. Roscommon: Archaeological and Geophysical Survey in a Ritual Landscape. Wordwell: Bray. A collaborative project with the Old Drogheda Society, Drogheda Museum Millmount and Dundalk Institute of Technology is investigating the Millmount site. 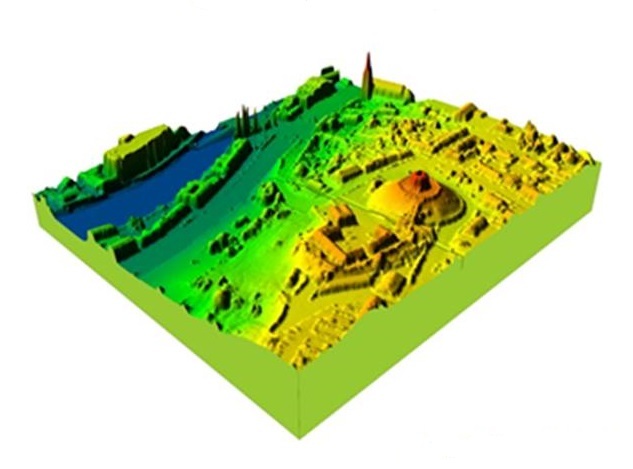 3-D LiDAR model of Millmount Mound overlooking the River Boyne in Drogheda, Co Louth. (Data : Office of Public Works). The mound is a complex structure in a commanding location with much use and re-use over a long period of time. The project is investigating the internal structure of the mound and the surrounding area using a number of geophysical techniques in order to present information on phases and types of activity on the site.